Some of these standards are observable during classroom observations, such as learning environment and instructional practices. However, others are not. For example, evaluators may not know all of the extra professional development you do outside of the classroom. 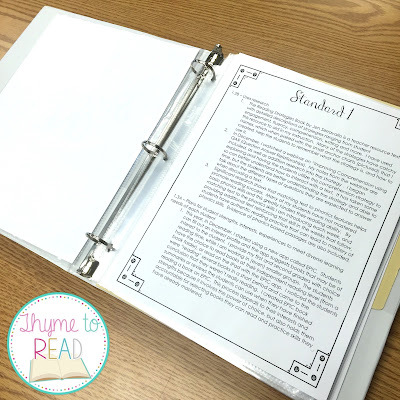 Whether you have to provide artifacts for every standard, just the standards that are unobservable, or just a selection as determined by your district, putting together an evidence binder can be stressful and overwhelming. I am currently in the process of putting together my evidence binder. Each year, I have tweaked the process and learned some things along the way. 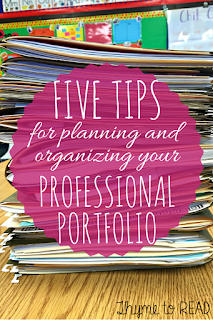 Here are five tips for putting together an evidence binder or portfolio. This tip may seem like a no brainer. You may be saying, "Megan, of course I'm going to look at the standards before I start collecting artifacts." Well during my first year, this was not the case for me. Yes, I read the standards and the rubric explanations, but I did not look at them closely and really try to interpret them. You know all the close reading we do with our students...yeah...DO THAT!! The difference in this standard between 'developing', 'effective' and 'highly effective' is the quantity of students engaged in the technology. Do you only use technology as a fast finisher option? Do you take your students to the computer lab when some of your students are being pulled for support services? Do you embed technology into your weekly/daily lessons and provide opportunities for all of your students? The other difference, in 'highly effective', is the ability to prove that students contribute to the variety of technological strategies used to engage them. For this, you may ask yourself, "Do my students select the technology they use to demonstrate their learning, or do they select the technology that will best help them to meet your learning objectives?" The other thing to keep in mind, is a message that came from my principal when she was providing us guidance on our evidence binders. Unfortunately, the difference between effective and highly effective are fractions of a point on the rubric. Don't break your back trying to prove that you are HIGHLY EFFECTIVE in every standard and performance indicator. Be honest and think, "Do I live in highly effective, or just visit there?" Whatever your answer, it is OK! The best part of putting together an evidence binder and reflecting on these indicators is setting goals for the future. teaching, I was so nervous about "THE BINDER!" 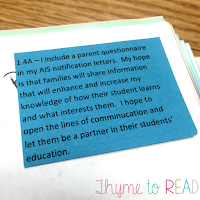 I looked at the rubric (remember Tip #1 - cough - oops!) and started collecting. 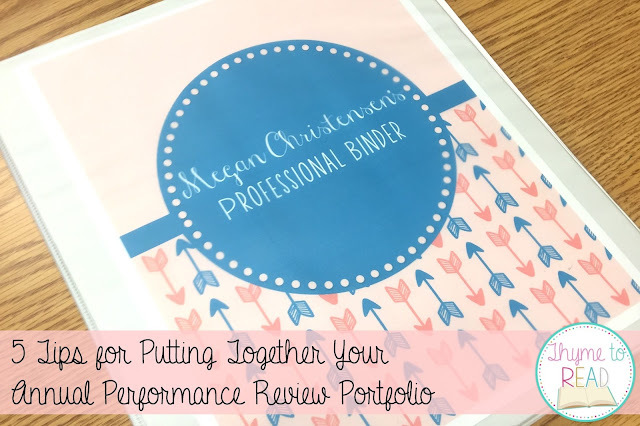 By the time Spring came around and it was time to start finalizing the binder for review, I had so much stuff! Everything in the moment seemed great and perfect, so I put it in a folder. As I started to sort through the papers, I had a ton of evidence for some standards, and no evidence for others. So many of the things that I saved had the same rationale (see tip #4), I could have easily saved two artifacts and moved on. Something to consider when planning for your binder - When you are lesson planning, do you plan for Monday, then Tuesday, then Wednesday... or do you plan Math for the week, then Reading, then Writing...? It is kind of the same thing with your portfolio. 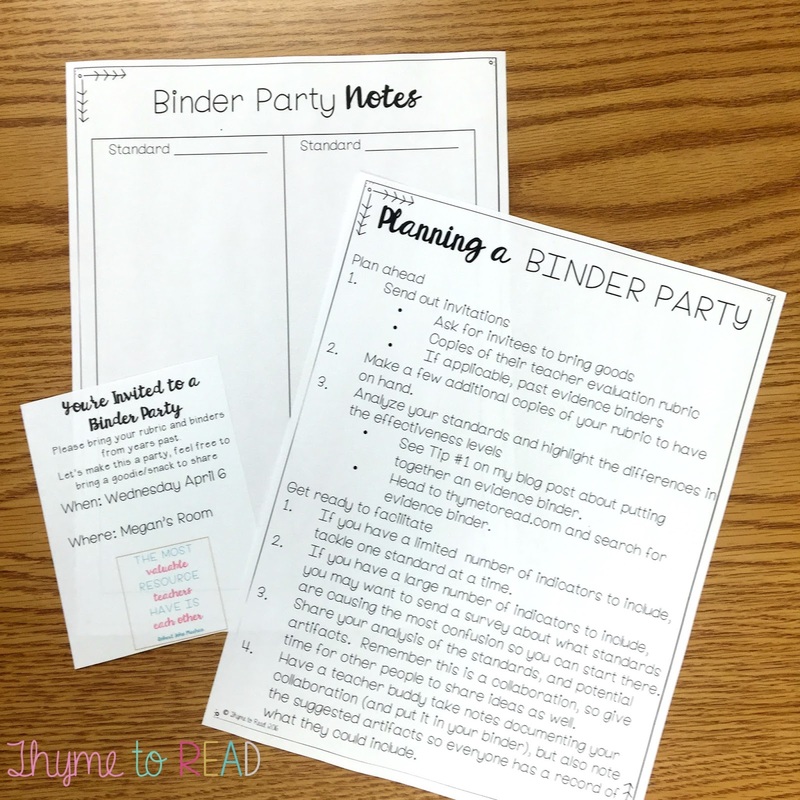 Schedule time a few weeks out to focus on the task of putting together your binder. You may find you will be more successful with selecting the high quality evidence you want reviewed. This is single tasking at its best. When I put my binder together, I focus on one or two standards per week and it takes me just over a month to pull it all together. I dedicate about 20-30 minutes each day after school to locating, copying and writing the rationale. By focusing on one standard and few performance indicators, I have a better handle on selecting the best evidence. Many of the teachers I have worked with find the evidence binder stressful. The evaluation rubric my school follows has 96 performance indicators (some are observable, and some are exclusively proven in the binder). That's a lot of evidence! and my colleagues. The way that I interpret an indicator, may be different than my best buddy down the hall. While you may not be whole heartedly saving evidence all year for your binder, you are most certainly keeping it in the back of your mind and have an idea of what might fit. Share those ideas and exchange examples of artifacts that might fit for each indicator. 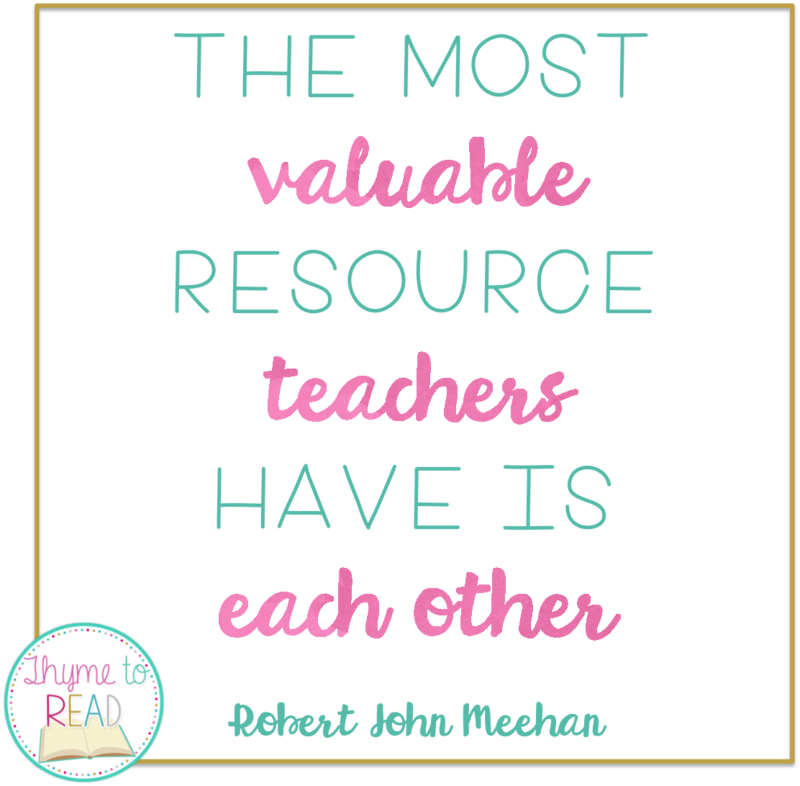 If you are part of a bigger grade level team, or if you are like me, and on a data team, SHARE evidence. Not just the ideas, but actually run to the copier and make copies for others to include. WAIT... I know what you're thinking. "Megan, you just said to not plan all year!" Yup, I did. And this tip does not contradict my last tip. You do not need to refile evidence you already have filed. You probably keep a data binder/folder and a conference log (for parents and colleagues). 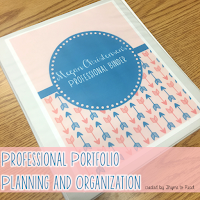 You may already have student work portfolios. You have attended professional development sessions and took notes which you filed away (somewhere), and you implemented a change suggested at that conference. Everything is filed away neatly so you can find it when you are not focused on your binder. Now is the time to go back into those designated locations and pull pages to copy for you and your colleagues to include in your evidence binder. I have "hosted" a binder party for the last two years and every year it gets better. It is a time to collaborate, exchange ideas and analyze our progress over the last year. Everyone brings something to share - light snacks, drinks, plates, napkins or cups. We meet for an hour after school and go over the indicators that are causing us headaches. It has been so helpful, and rumor has it, next time we meet, an administrator will join us. What a great time to find out the inside scoop of what they are actually looking for. Go ahead, invite your admin too! Congratulations! You've done the hard part. You have analyzed those standards, and gathered the evidence you feel shows off the kind of Teacher Boss you are. 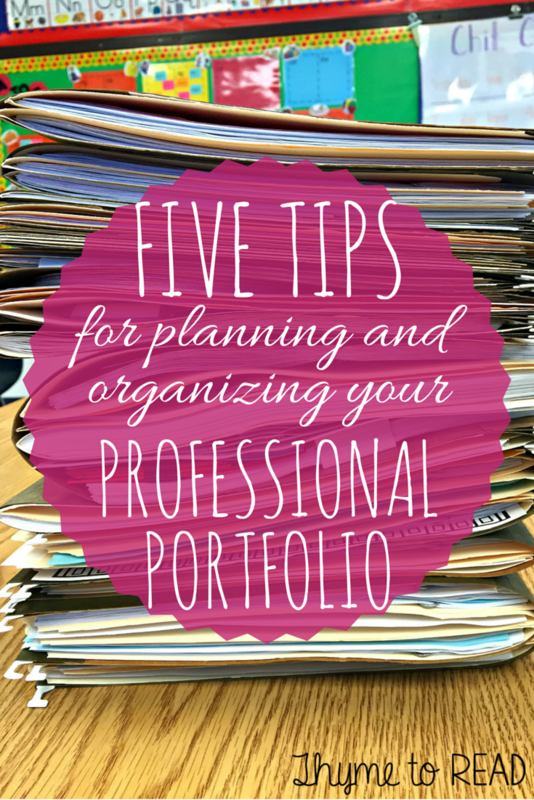 You are almost ready to submit your portfolio to your administrator. Before you do, these last two tips explain how you can make their job easier. Let me set the stage - You have a student who has poor handwriting and paragraph organization. You almost dread scoring their assignments. You know how much effort you need to put in to grade their papers. This student always has the right content and overall message, but you have to do a lot more work to give them the points they deserve. For your own sake, don't make your administrator work that hard when scoring your binder. You are one of many portfolios they have to review and you want to make their job easy. The less you leave for interpretation, the better the chances of you getting a score you feel you deserve. your binder, get that handy dandy tool back out. Use the language from the rubric to explain your artifacts (you know TTQA - Turn the question around). Then, elaborate by explaining how the artifact is regularly used in your classroom. In the case of my binder, my administrator could score my rubric solely on my rationale pages. I provide artifacts to show examples of student work, pictures from my classroom, copies of logs, or examples of data collection, and basically just show that I'm not making all of the goodness up. Even though typing up the rationale pages takes extra time, I am confident that it makes my evaluator's job easier. By including rationale, you give them no choice but to recognize all that you do! Now that you've taken the time to explain each artifact, don't make your administrator guess what artifact the rationale is explaining. Hopefully they won't need more proof than your rationale, but again the actual artifact is there to prove you are actually doing what you said you were. In the picture above, you can see my rationale page. I list the standard and performance indicator (1.6A), then under the standard, I list by number, the artifacts that will follow. You can see in the picture on the right, I label the actual artifact with the corresponding standard and number (1.6A #1). This particular artifact applied to two standards (1.3A and 1.6A). Check with your evaluator, they may not want you to cross reference artifacts for ease of scoring! To label my pages, I just used some fancy masking tape and a sharpie. In the past, I would print on Post-Its, and include my rationale on each artifact. While I LOVED this method, I never had enough room to thoroughly explain all that I wanted or needed to. I could have used bigger Post-Its, but I didn't want to cover up too much of the artifact itself. I am always learning and adapting - who knows, maybe next year I will go back to my printed Post-Its. But the big message here, whether you write a rationale page, or a rationale Post-It, is to explain why you selected a specific artifact and label it. Make sure your administrator knows what indicator you are trying to prove, so you get the credit you deserve! If you have any questions about these tips, please reach out to me. You can leave a comment, or email me at megan.thymetoread@gmail.com. I look forward to hearing from you. If you want to save this post for later reference, click the picture below to Pin! Best of luck putting together your evidence binder.